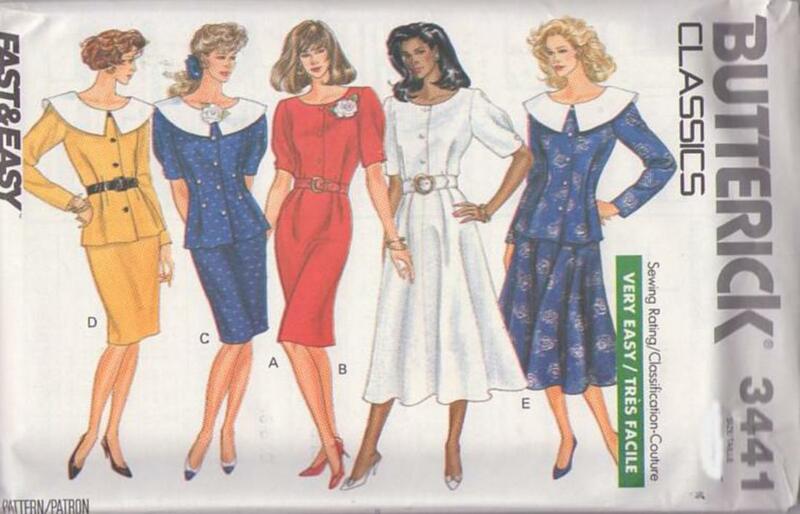 1989, 80s Career, Retro Beginners Clothing Patterns - MISSES'/MISSES' PETITE TOP & SKIRT Loose-fitting top (semi-fitted through waist), has front and back tucks and above elbow sleeves with tuck and button trim or long sleeves. C: button trim. C,D,E: contrast collar. Straight or flared skirt, mid-knee, below mid-knee or below mid-calf, has waistband, front pleats and back zipper. Purchased belt and flower.